Temperate coniferous forest is a terrestrial habitat type defined by the World Wide Fund for Nature. Temperate coniferous forests are found predominantly in areas with warm summers and cool winters, and vary in their kinds of plant life. In some, needleleaf trees dominate, while others are home primarily to broadleaf evergreen trees or a mix of both tree types. A separate habitat type, the tropical coniferous forests, occurs in more tropical climates. Temperate coniferous forests are common in the coastal areas of regions that have mild winters and heavy rainfall, or inland in drier climates or montane areas. Many species of trees inhabit these forests including pine, cedar, fir, and redwood. The understory also contains a wide variety of herbaceous and shrub species. Temperate coniferous forests sustain the highest levels of biomass in any terrestrial ecosystem and are notable for trees of massive proportions in temperate rainforest regions. Structurally, these forests are rather simple, consisting of 2 layers generally: an overstory and understory. However, some forests may support a layer of shrubs. Pine forests support an herbaceous groundlayer that may be dominated by grasses and forbs that lend themselves to ecologically important wildfires. In contrast, the moist conditions found in temperate rain forests favor the dominance by ferns and some forbs. Temperate rain forests only occur in 7 regions around the world - the Pacific Northwest, the Validivian forests of southwestern South America, the rain forests of New Zealand and Tasmania, the Northeastern Atlantic (small, isolated pockets in Ireland, Scotland, and Iceland), southwestern Japan, and those of the eastern Black Sea). Forest communities dominated by huge trees (e.g., giant sequoia, Sequoiadendron gigantea; redwood, Sequoia sempervirens; mountain ash, Eucalyptus regnans), an unusual ecological phenomena, occur in western North America, southwestern South America, as well as in the Australasian region in such areas as southeastern Australia and northern New Zealand. The Klamath-Siskiyou ecoregion of western North America harbors diverse and unusual assemblages and displays notable endemism for a number of plant and animal taxa. Carpathian montane conifer forest, Slovakia. 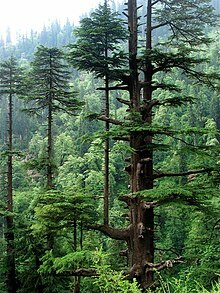 Cedrus deodara in the Western Himalayan subalpine conifer forests. A temperate coniferous forest ecosystem in Petroglyphs Provincial Park, Ontario. Fitzroya forest at Alerce Costero National Park, Chile. This article incorporates text available under the CC BY-SA 3.0 license. World Wide Fund for Nature. "Temperate Coniferous Forest Ecoregions". Archived from the original on 2011-01-02. ^ Kellogg, E; Weigand, J; Mitchell, A; Morgan, D (1992). "Coastal temperate rain forests: ecological characteristics, status and distribution worldwide". Portland, Oregon, USA: Ecotrust & Conservation International. Occasional Paper Series No. 1. ^ Kauffmann, Michael (2012). Conifer Country. Kneeland: Backcountry Press. ISBN 978-0-578-09416-8. Waring, Richard H (2002). "Temperate coniferous forest" (PDF). Volume 2, The Earth system: biological and ecological dimensions of global environmental change. Chichester: John Wiley & Sons, Ltd. pp. 560–565. Retrieved April 18, 2012. 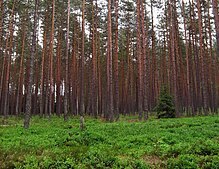 Wikimedia Commons has media related to Coniferous forests.